MILWAUKEE – Nov. 16, 2017 – Serve Marketing, the country’s only all-volunteer, nonprofit advertising agency, is celebrating 15 years of behavior-changing public service campaigns for nonprofits across the nation. Founded by Milwaukee ad man and BVK Executive Creative Director Gary Mueller in 2002, Serve has produced head-turning campaigns for over 100 nonprofits, contributed 125,000 volunteer hours and more than $18 million in donated services. The agency’s most notable work has been centered on some of Milwaukee’s most critical issues ranging from teen pregnancy, human trafficking, co-sleeping, shaken baby syndrome and more. Serve recently celebrated the results from its ongoing decade-long campaign with the United Way of Greater Milwaukee & Waukesha County, called “Baby Can Wait.” The initiative helped Milwaukee’s teen birth rate decline 65 percent, reaching a historic low since the campaign launched in 2006. “Turn A Life Around” in partnership with the Coalition of Children, Youth and Families, generated a 485 percent increase in foster parent inquiries in Wisconsin. “Unlucky 13” in partnership with the Human Trafficking Task Force of Greater Milwaukee helped create unprecedented awareness of the human trafficking crisis within Milwaukee. 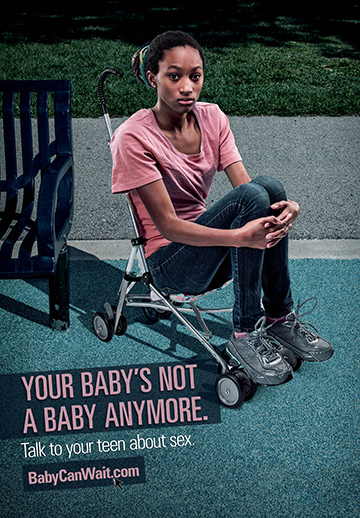 “Baby Can Wait” in partnership with United Way of Greater Milwaukee and Waukesha County helped to lower Milwaukee’s teen birthrate by 65 percent since 2006, reaching a historic low. The popular “Strong Baby” campaign in partnership with the Milwaukee Health Department, and other community programs, helped Milwaukee experience a 13 percent reduction in the infant mortality rate, its lowest rate in decades. “Get Checked Omaha” in partnership with the Women’s Fund of Omaha helped increase awareness for STD testing of adolescents, with STD tests increasing by 29 percent since September 2015. Gary Mueller, founder of Serve Marketing, is also the agency’s Volunteer Creative Director and Managing Partner at BVK, a Top-25 independent advertising agency located in Milwaukee. His career has earned him international advertising awards and recognition, but he says it’s his work with Serve that makes him most proud. In recognition for his outstanding work and unwavering commitment to community causes, the city of Milwaukee has declared November 15 “Gary Mueller Day,” marking the 15th anniversary of Serve Marketing. In 2018, Serve and its volunteers will be working with the Milwaukee Health Department and United Way on its ongoing infant mortality campaign, as well as teen pregnancy prevention and STD awareness, a foster care recruitment campaign for CCYF, social media and event promotions for Milwaukee-based Guitars4Vets, and continuing to increase human trafficking awareness and education in Milwaukee through campaigns with Lacey’s Hope and Exploit No More organizations. For more information about Serve Marketing and its work, visit www.servemarketing.org.